"So the next time you see a space shuttle launch, you can tell your friends which personal computer is rated for mission-critical use in the United States space program." Amiga owners know their machines can do a lot with a little. Because of its flexible and integrated video-friendly hardware as well as its tight, efficient multi-tasking operating system, Amigas can be found driving things such as stadium scoreboards, interactive kiosks, agricultural irrigation systems and the flight schedule displays at Atlanta's Hartsfield International Airport. The Amiga was chosen for those applications because its reliable hardware and low-overhead software means less down-time for those crucial jobs. But most Amiga owners would be suprised to learn just how much their machines' reliability is trusted to carry out one of the toughest jobs in the world - or outside of it. 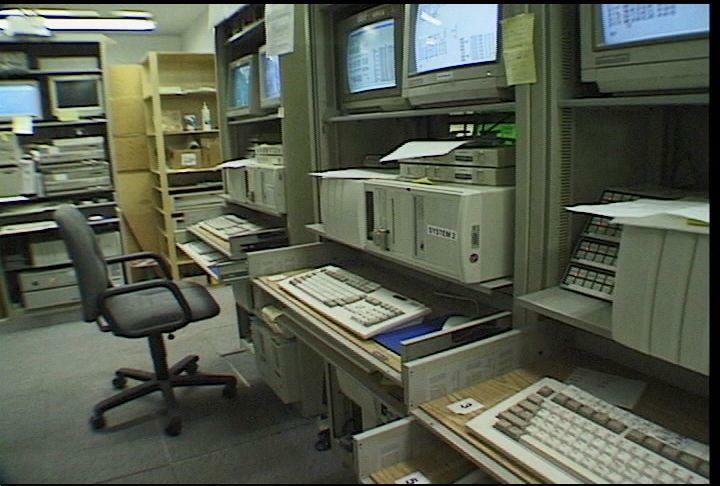 For more than a dozen years, Amiga computers have been hard at work at Cape Canaveral's Hanger AE supporting the launches of every American spacecraft including the space shuttle. Since after all, this IS rocket science, NASA must downlink a tremendous amount of data from each spacecraft; during ground tests, through the countdown and lift-off and out into space. There is no room for error in the acquisition and processing of this data. It must be accurately calculated and reliably sent from the hanger to distant space centers around the world participating in the mission. All in real time and without interruption. Since Hanger AE also supports some telemetry from the space shuttle, that importance is even greater since human lives are on the line. Amiga screen displays live user data from the orbiting space shuttle! 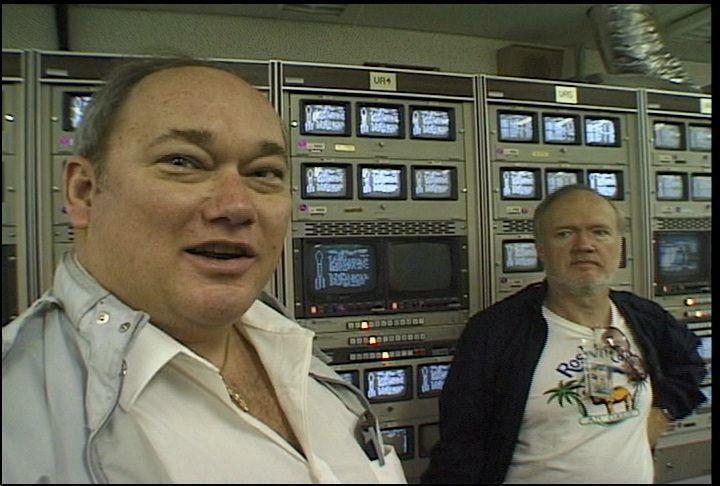 Thanks to the efforts of Space Coast Amiga member, Hal Greenlee and retired Air Force Lieutenant Colonel Johnny Johnson, Amiga Atlanta was allowed an exclusive television tour of Hanger AE during the flight of the space shuttle Endeavour to the Russian MIR space station. Gary Jones, principal systems engineer for NASA's software systems at Cape Canaveral told us the Amigas take in all the telemetry data from the spacecraft, scale it by applying coefficients of up to fifth order polynomials and convert the data back to engineering units for display to the engineers working the launch. Gary went on to tell us that their first choice was the Macintosh, but as it was a closed system, Apple wouldn't give NASA enough information to get into it at the level that was needed. Talk about blowing a marketing opportunity! He continued "We then looked at the PC, but the hardware architecture was really as bad then as it is now. So Hal was the first one who brought out one of the Amiga 1000s and we played with it." Hal Greenlee added; "I brought it out and showed it to Dave Brown, and not more than about a month or two later, Dave had one of his own, and we were both saying to Skip, "We need to get some of these babies, and find out if we can make them work for this job"." Gary Jones replied; "And Commodore was easy to work with back then. When we asked for documentation, they sent us a stack of documentation about four feet high. They were willing to tell us everything about their machine. Since we had to design some custom hardware to go inside, it really helped to know exactly how everything worked." "It just turned out that it was a good machine. The things that make a machine good for playing games also tend to make it good for processing and displaying data, because you've got some of the same problems. You need a very efficient, very fast operating system, and the Amiga has that and very little overhead too. That's what makes it nice; we don't load down the system running the overhead; we can just process the data." "Most of our customizing is hardware customizing. The Amiga operating system is flexible enough that we have to drop into assembly only once in a while to initialize some of the special boards we use, but otherwise the operating system is fine; we don't do anything unusual with it. We use it just like it is and build hardware for our interfacing requirements because we have to pull the data out of the data bus in this building, process it, and put the data back in." Seven Amigas are online assigned to operational support, six are dedicated to routing data to remote space centers and another six are reserved for hardware and software development. The spacecraft supported by the Amigas include all of the Atlas-Centaurs, Delta II and Delta III, the Orbital Sciences Pegasus, Lockheed-Martin Athena and a couple different models of the Titan. GOES and GPS spacecraft data are processed, and some user data off the space shuttle. Because of way the Amiga is laid out and because the software is all tied together, each machine can actually support more than one spacecraft at a time, if the bit rate isn't too high. A multi-tasking, multi-spacecraft personal computer! 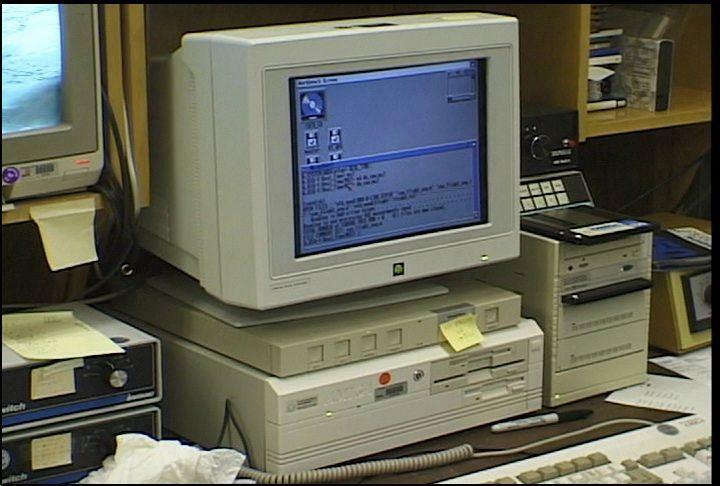 Even though the Amigas play an important role in handling telemetry, they are versatile enough to interface with other NASA computers. Augie Friscia of Boeing Aerospace told us, "I figured out a way of transferring files from the Amiga to a Sun by converting the source files I had on the Amiga to an archive and then transferring them to a Sun machine. With just a few minor adjustments to the top of the program and the declare statements, I could compile and run it on the Sun. I did all the debugging on the Amiga and then took it to the Sun." Gary Jones: "If its not a PC, NASA gives us a lot of grief when we try to buy anything to go with the Amigas. They want us to buy PCs and run Windows 95 and NT. We keep trying to tell them its not fast enough so they tell us to buy DEC Alphas. We tell them its too expensive. They don't like the Amiga; it doesn't cost enough." During our January 1998 visit to Hanger AE, the space shuttle Endeavour had just finished retrieving David Wolff from the Russian Mir space station. 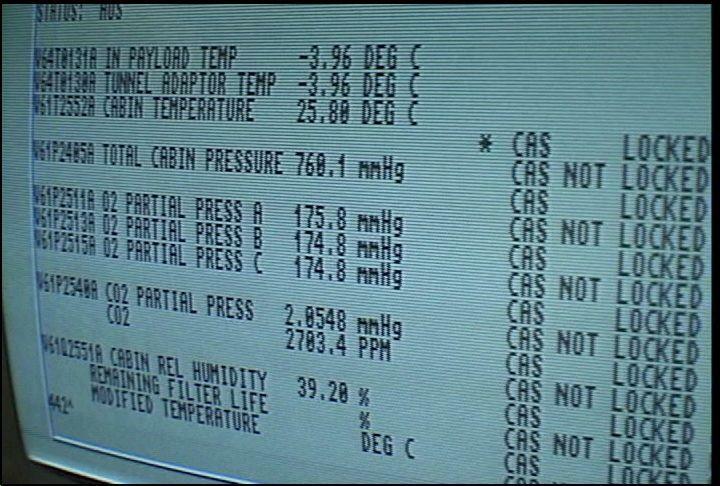 Gary Jones: "This is data coming down from the shuttle - the STS-89 flight that was docked with the MIR up until yesterday. These are some of the environmental parameters that the life sciences people use. They take this data, we process it with the Amiga, we remote it to them on another Amiga which then pulls up data and sends it to their PC which controls an environmental chamber so that they can duplicate the environmental conditions on the shuttle down here except for gravity. So that's their control group. They can have a group of animals or insects on the shuttle in zero G and the same animals in the same environmental conditions with normal G about five hangers down the road from here. And the Amiga data is what they use to control their growth chamber to keep the environment the same." Amiga 4000s photographed at work during Jan. 1998 shuttle mission to Russian Mir. 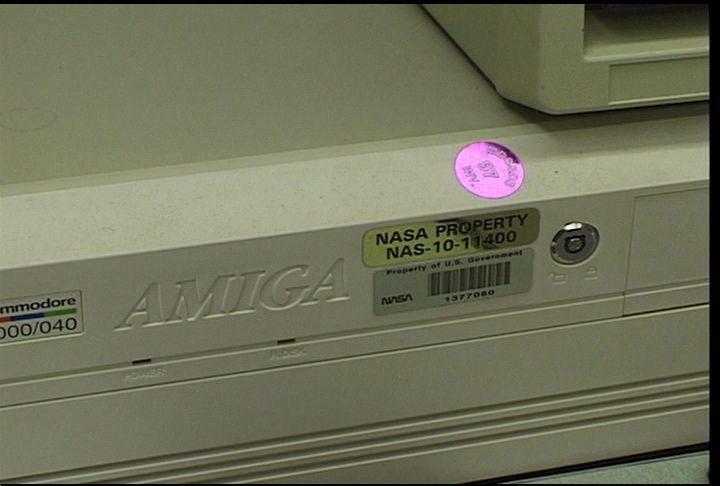 In the NASA Amigas, custom interface hardware is built and used inside. But the most important difference between their Amigas and ours is on the outside. An armor-plated power button was built out of a 23-pin video connector because the engineers were concerned that the crucial switch was just a little too exposed on the front of the Amiga case! To prove how useful even stock Amigas can be, we found out that although the 4000s have Workbench 3.1, the 2000s are still running 2.1 because the advantages of the newer operating system were not really needed. Even after seeing Amigas hard at work in the telemetry lab, another surprise was found in the television center. Hal Greenlee; "We have a toaster system. We add titles during the launch. We might do an effect or two just by way of making the tape look more interesting. But mainly the Toaster is used to overlay time, camera angle or some kind of text data that they want to add to the picture." Three hundred video monitors are fed by a routing system large enough to run a ommercial TV network. In addition to video, it can also route data over the entire space center. Future plans for the NASA Amigas include supporting another model of the Titan rocket. They are also in the process of writing software for the next generation Delta rocket called the Delta III. The American Atlas-Centaur rocket is scheduled to have Russian engines installed onboard that will also need new Amiga telemetry software. Gary's team will also build a new display capability for the users that will be driven by the Amiga. "We'll send them the data over an Ethernet system, and they'll use PCs just to do displays." Although not as easy to purchase and support as other microcomputers, Gary remained cautious about Gateway's purchase of the Amiga platform. "We've gotten a little feedback from Hal on Gateway's purchase of the Amiga. If we start seeing that they're shipping some hardware we'll get interested then. But it's an uphill battle trying to convince NASA that they want to go with something other than one of the standard, accepted platforms." So the next time you see a space shuttle launch, you can tell your friends which personal computer is rated for mission-critical use in the United States space program. Note: this article was based on a ten minute videotape taken during Amiga Atlanta's visit to Hanger AE. Contact Bob Castro (bcastro AT mindspring POINT com) for details. Special thanks go also to Amiga Atlanta member Mike Ellenberg who grabbed the still frames from the video you see in this article.